Employment reference letter is analogous in content and formatting as the job reference letter wherein employees appreciates and recommends the work of the peer in the group and authenticates and mentions the same in a formal letter of reference. 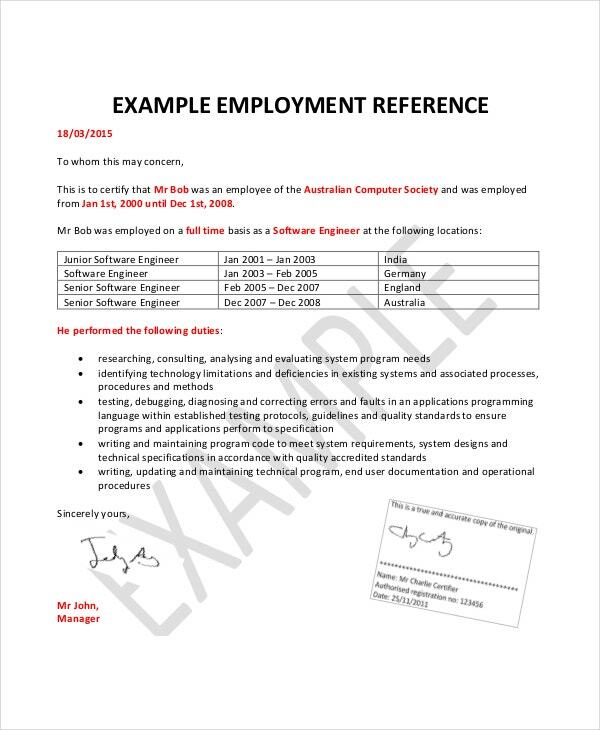 Employment reference letters from a family member or a school/college friend, however, may not be considered as an effective tool of demarcation of the employee. 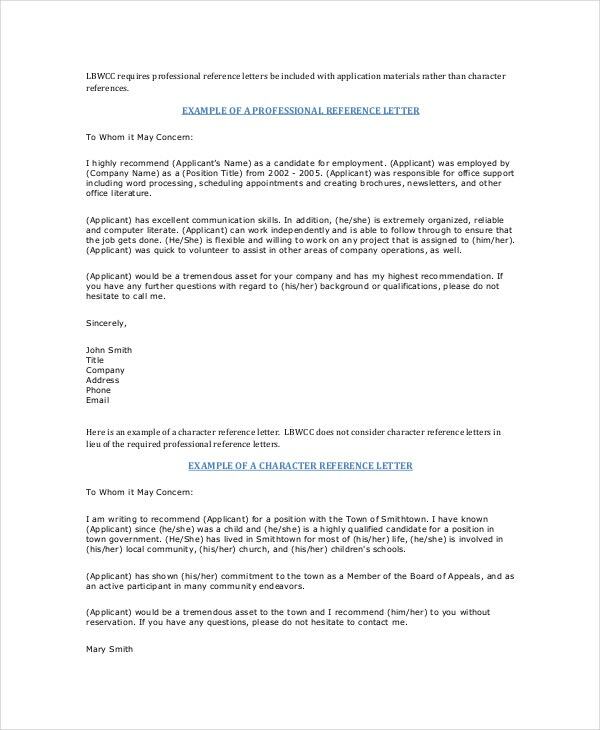 You can also see Character Reference Letters. 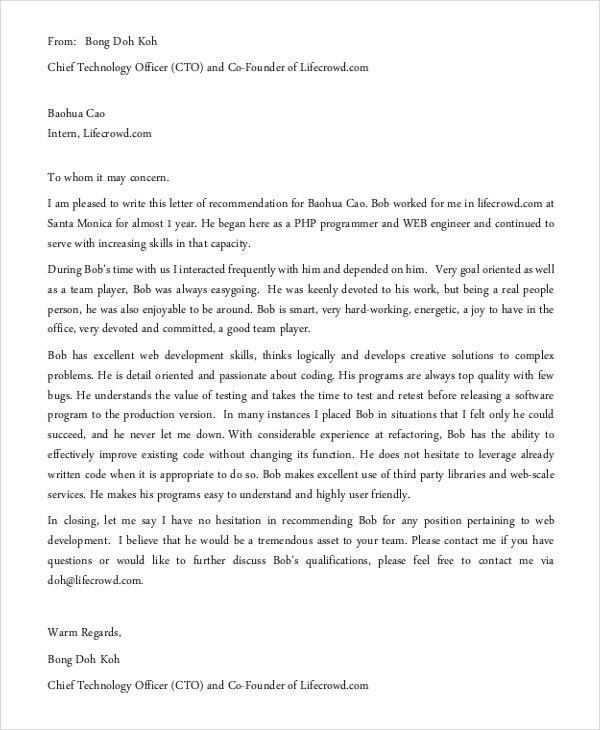 Since, this letter mostly certifies the Personal Reference Letters efficiency and capability of the candidate, therefore such letters should only be sent by colleagues and peers (preferably of the same project team as that of the candidate). These letters are mostly in Word or PDF format. 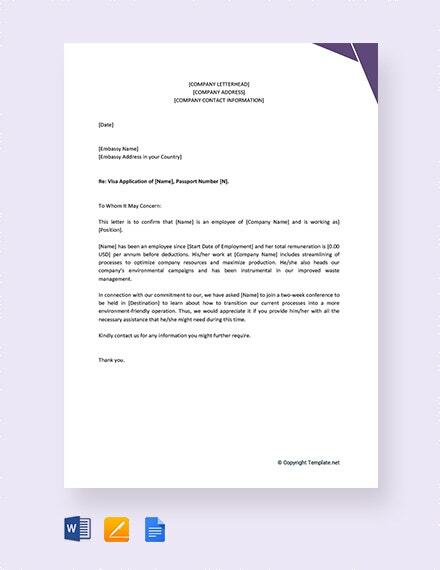 The reference letter for employment is for the position of an accountant as well as written by a person to who the applicant reported at the time of tenure of his employment. The letters detail high role in the organization as well as how efficient he/she managed critical situations without losing his presence of mind. 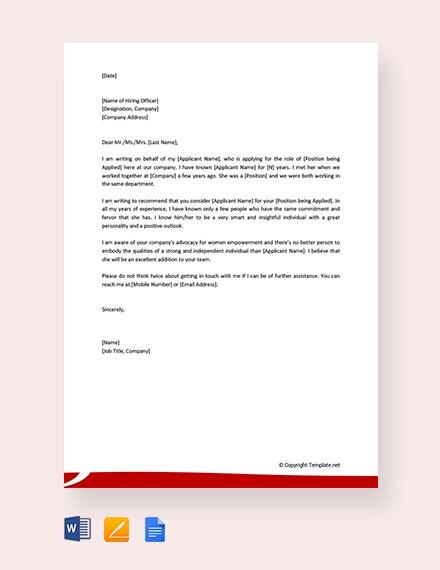 A reference letter is available in document format. The common kind of letter for reference is reference letter for the employment. This type of letter is commonly written by a candidate senior or colleague detailing his/her role in the organization. 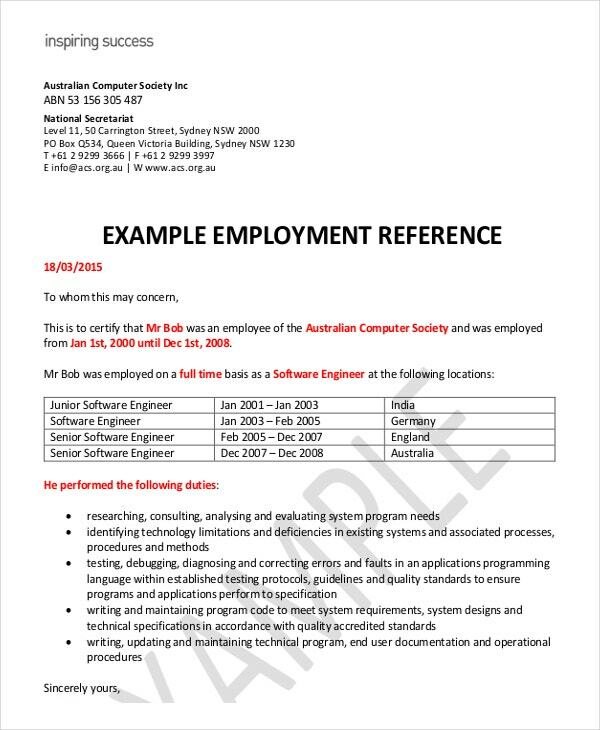 The employer those who are applying for a job can download this reference letter template and edit all those required details. The reference letter also recognized as a letter of reference whereas individuals assess the capability of another individual and provide a recommendation. The employment reference letter is available for free download option in PDF format so that candidate can download it easily and fill out the essential details as per their needs. 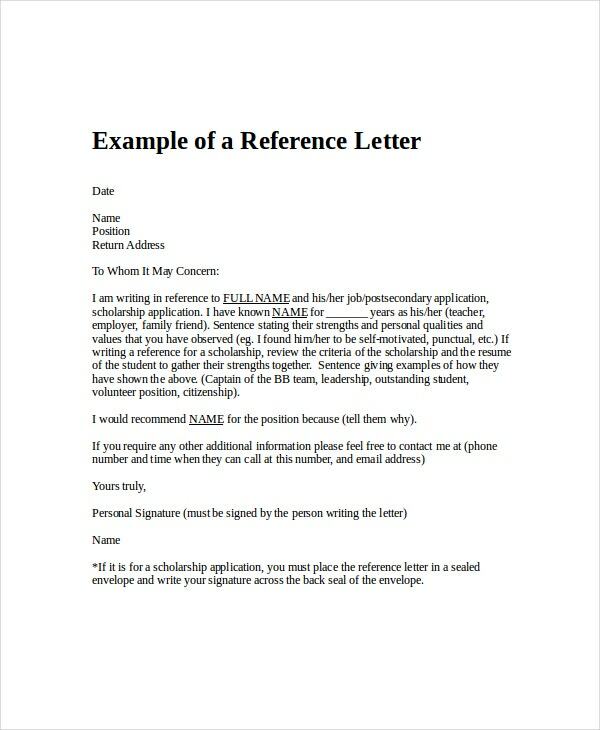 The reference letter template will aid you to formulate an efficient job reference letter. 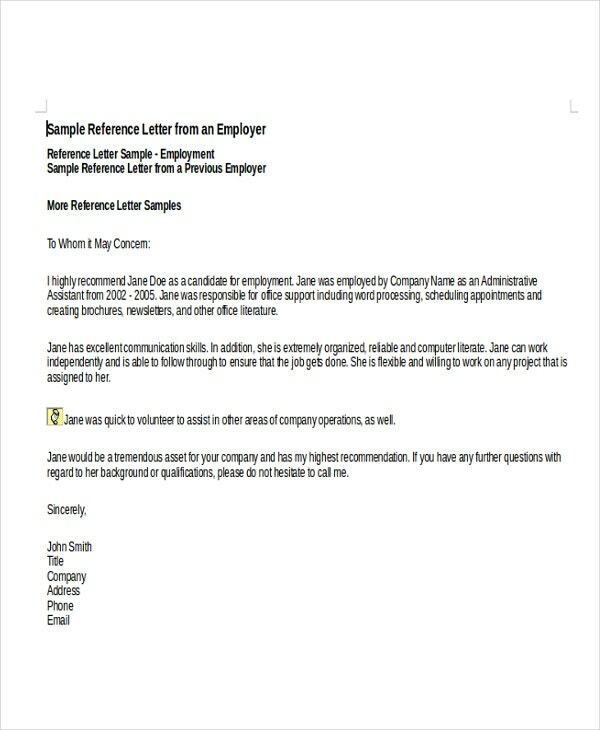 In addition, the sample reference will letter will offer practical guidelines to write your own employment reference letter. As an employer, you can also adapt the employment reference letter template to fit the specific circumstance of the employment. An employment reference letter is a recommendation letter whereby a person has the capability of another person as well as provides recommendations. The individuals who write the recommendation letter plans at approving the person skills and capabilities in a positive manner. 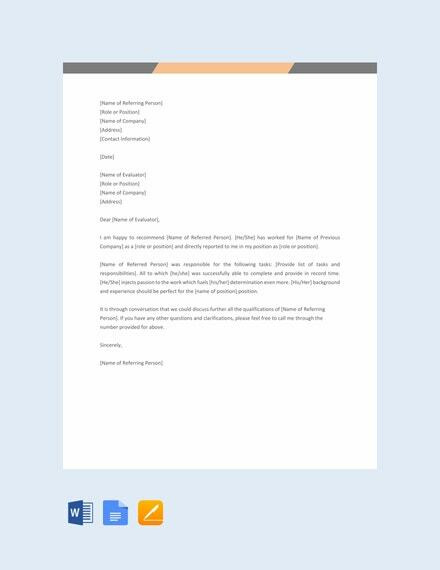 This type of reference letter is highly helpful for job applying candidate to get the recommendation. This Reference Letter Templates offers an optimistic reference for a former employee along with plenty of details regarding the details of the candidate ability. 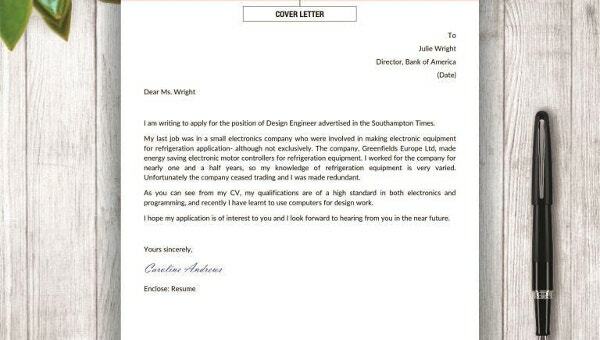 The candidate those who are applying for the job then this employment letter will be highly useful for them to applying for a job. 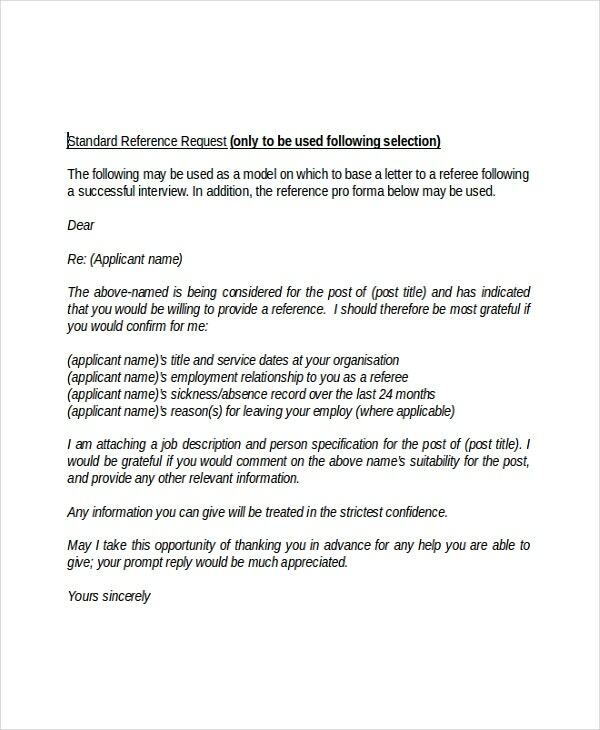 > When do you need Employment Reference Letter? A reference letter is written for the business purpose to qualify the truth that an individual is an ability to execute a specific job. The reference letters for business purpose are essentially various in tones and differ from other reference letters. Furthermore, a well-written reference letter goes a long approach to assist the best candidate to secure a high- paying, acceptable job. Apart from the job capabilities of the candidate, a reference letter also informs the employee regarding his or her work character and ethic. Free download options are available in the online in the template format. The employment reference letter is mainly designed for employment promotion which means for the position of a consultant. In addition, the letter is written by a senior as well as suggests the services of an employment who has worked under him for a long duration of time. 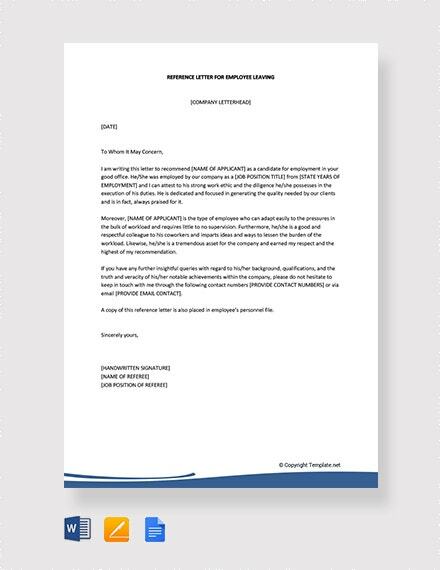 The reference letter for employment from the manager or else immediate supervisor continues several significant as they were the ones who were straightly relevant along with the candidate performance. A good professional employment reference letter will address the context of the job as well as offer a reliable description regarding the candidate in an easy manner. Target it to the job employee is applying for. You can also see Free Reference letters. At first, discover out from the person who requested the letter of reference if they are searching for a personal reference, reference based on particular qualifications, or character reference. • Use an appropriate business letter format. • It offers details regarding how you know the applicant, including facts regarding position they have held, responsibilities, skills, employment date and character. • You have to attach details about their strengths as well as talents that the applicant may not know or else may be mainly valuable. • You also need to include a statement saying whether or not your reference the individual as well as whether you consider the individual is qualified if it is likely to make such an appraisal. • Offer examples that support your recommendation, if possible. Our entire employment reference letter template is available in both Doc and PDF format based on your needs you can download and edit your required details. Our templates hold a greater compatibility for both upper and lower versions. For better result, choose our template and gain several additional benefits.